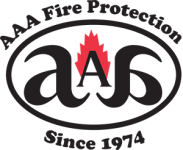 If you’re not sure what type of grease filters are in your commercial kitchen, it’s time to call the experts at AAA Fire Protection Services. Every day that you have the wrong kind of filter can be an expensive decision, as outdated or dirty filters can easily cause kitchen fires. It was recently noted by the prestigious National Fire Protection Association that the majority of commercial kitchen fires are started by cooking flames that flare up and penetrate greasy filters. Setting your filters up on a cleaning schedule can be challenging. A well-maintained filter that is cleaned regularly may remove as much of 80 percent of the grease passing through, but in real-life situations that number is much lower. Grease fires can be exceptionally damaging, especially since they can flare up and grow so quickly. We want to keep your business safe from harm, so the experts at AAA Fire Protection Services created a grease filter exchange service that will remove your aging commercial kitchen grease filters and replace them with new, fully UL-300 compliant grease filters. No more worry that your kitchen is one grease fire away from the devastation to people and property that can occur with an out-of-control fire. Instead, these modern, 18-gauge galvanized filters are also UL listed to meet state and local codes as well as National Fire Protection #96 standards. We are passionate about ensuring our clients are safe – and that includes to the resources and materials that we recommend. Contact our filter maintenance and cleaning specialists today at 855-788-7807 for a free, no-obligation quote or to learn more about the importance of keeping filters clean and well maintained. The new generation of filters are baffle filters, which function by removing microscopic droplets of grease from your exhaust. What’s better is that these units are much quicker to clean and require less invasive cleaning agents than traditional filters do. Plus, baffle filters optimize air flow throughout the system, making it that much less likely that a dangerous grease fire will trigger due to excess buildup.